Ken and Deborah are established financial industry professionals with more than 40 years of experience combined. Believers in and advocates of lifelong learning, Ken and Deborah have earned and maintained all the necessary securities and insurance registrations, licenses, and designations necessary to provide their clients with the best possible advice and guidance. They are experts in the financial planning process, which includes (but is not limited to) determining their clients' goals and expectations, gathering data, analyzing and evaluating their clients financial status, developing and presenting financial planning recommendations and alternatives, implementing the financial plan, monitoring their clients' progress toward their goals, reporting to their clients periodically, and making adjustments to the plan as needed. Ken and Deborah, both lifelong residents of the Capital region, live near their main office in Castleton with their three beautiful children: Ethan and twins Grace and Ryan. In 2008, after an extensive and exhaustive search, they found the perfect location on which to build their dream home, a log cabin, on some long-neglected and overgrown farmland. Outside the office, if Ken and Deborah are not at a local library or playground, you can usually find them at home with the kids and taking care of their cat Harley, a few ducks, and a few too many chickens. In addition to helping his clients achieve and maintain their financial health, staying physically fit and healthy is important to Ken. He is active in the Capital District Triathon Club, where has served both as President and as head of the Sponsorship Committee. Each spring and summer, Ken enjoys training for and participating in triathlon races of all distances, from 14-mile sprint races to 140.6-mile Ironman events. Since 2010 Ken has completed a total of 11 Ironman distance races, nine in Lake Placid, NY and two in Cambridge, MD. He is currently training to compete at the Ironman race in Zurich, Switzerland in July of 2019. Throughout the years, Ken has enjoyed success by applying to his triathlon training and preparation the same disciplined, planning-based approach that he and Deborah take in their investment management and financial planning roles with clients. If he is not preparing for an upcoming race, Ken might be fishing with his kids, volunteering as a coach, or enjoying activities and events with the local Cub Scout Pack 253, where her serves as an Assistant Den Leader. In addition to raising a family and running a business, Deborah manages to stay very active in the local community. She has volunteered at a local preschool, assisting with bookkeeping, payroll, and tax filings. She has also served with the AARP as a volunteer tax preparer for senior citizens and has acted as treasurer for both the Maple Hill Preschool and the East Greenbush/Capital Region Chapter of the MOMS Club. Deborah also looks forward to her standing Sunday movie and dinner date with her 81-year-old father, Ted. 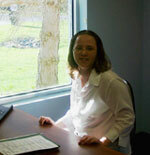 Jessica started at Center Square Asset Management in 2006 and is studying for her paraplanner designation. She is responsible for handling a variety of client service requests, such as locating duplicate account statements and tax documents, saving trade confirmations, and processing deposits and withdrawals. Jessica lives in Rensselaer, New York, with her husband, Mike, and their two children, Eternity (age 20) and Michael (age 18). Eternity is attending SUNY Cobleskill to study social science and physical education, and is on the soccer and softball team. Michael is a senior in high school and plays both varsity football and baseball as well as varsity bowling. As you might imagine, if you need to find Jessica, start by looking at the nearest gym or athletic field. In what little spare time she has, Jessica serves as the treasurer for the Upstate Rebels baseball team. She also enjoys spending time with her family and the neighborhood children.